Just after a morning rain, Gourma Mamadou was shopping in this capital city's crowded, open-air Kaloum market. The young man said he was well aware of the current Ebola outbreak simmering some 4,000 kilometers to the southeast in the Democratic Republic of the Congo, where the World Health Organization reports it has killed 28 people since April. The outbreak may be relatively far away, but fear of Ebola is not. Madamou said most of the Guineans he knows don't mention Ebola, as if just speaking the word would invoke its terrible wrath. The virus ravaged Guinea, Liberia and Sierra Leone from 2014 into 2016, leaving 11,000 people dead, including 2,500 in his country. People "are watching carefully," the young shopper said, suggesting that frequent hand-washing and other hygienic precautions grew more commonplace with the Ebola experience. "Sometimes, it's hard. That disease is so viral, but since it's been eradicated, we don't want it back in Guinea." FILE - A health care worker, right, takes the temperatures of school children for signs of the Ebola virus before they enter their school in the city of Conakry, Guinea, Jan. 19, 2015. Some good also grew out of Guinea's exposure to the virus: more information. 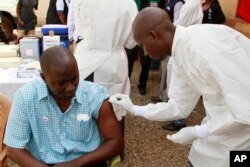 Late in the West African outbreak, almost 6,000 people in Guinea were vaccinated with an experimental therapeutic, V920. A December 2016 report in The Lancet medical journal said the inoculations bolstered the interim finding that the vaccine "offers substantial protection." That same vaccine, not yet licensed in any country, is now being used in the DRC's northwestern region. Pharmaceutical company Merck sent roughly 8,600 doses to Equateur province. Dr. Sakoba Keita, who oversaw Guinea's Ebola response and directs the country's National Health Security Center, praised the vaccine. "For us, the vaccine is very effective," he said, saying it protected 95 percent of those inoculated and "greatly helped stop the chain of transmission of the Ebola virus in Guinea. That is the reason why the vaccine is at the forefront of our response mechanisms." 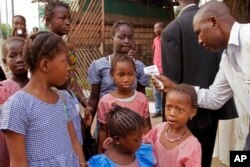 Keita, more commonly known as "Dr. Ebola," leads Guinea's fight against a recurrence of the disease. He said the country of 13 million learned hard lessons from its Ebola experience. Like its neighbors Liberia and Sierra Leone, Guinea was unfamiliar with the deadly virus. The outbreak, traced to a young boy infected by a bat in a Guinean jungle in December 2013, wasn't identified until March 2014. Then, as now, the international community stepped in to help. The World Health Organization worked with local governments to coordinate a response. Aid groups such as Doctors Without Borders (Medecins Sans Frontieres, or MSF) provided medical teams to support local health care workers and treat patients. The United States was among the foreign governments joining in the effort to halt the disease, sending health workers, researchers and aid to help with a public awareness campaign, disease tracking and patients' treatment. The DRC has the most experience in combating the disease, which originally surfaced in 1976 in an area near the Ebola River. When Ebola broke out in Guinea, the DRC sent experts there. So, when the DRC's ninth Ebola outbreak surfaced months ago, Guinea — at the WHO's request — sent medical personnel in a gesture of solidarity. Given the DRC's repeated outbreaks, Keita said it's important to be ready in case Ebola ever returns to his country. Keito said Guinea is more prepared now than it was before its Ebola outbreak. Health workers have learned to recognize the disease and its symptoms. The general public is more aware of it, too. And Conakry's Donka Hospital — the country's biggest health facility, where MSF operated an Ebola treatment center — is being expanded to meet needs. "As we learn new things about the disease," Keito said, "we prepare so that we are ready to contain it quickly if we were to face a new outbreak." Abdourahmane Dia is a multimedia journalist with VOA's French to Africa Service.